Who is that mysterious man of mystery? 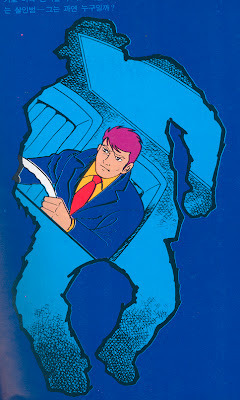 Or more importantly, who drew and colored him? This mysterious book has been on my desk for over a year now. I'm not sure where it came from. What really interests me is the bold use of color. Check out the book cover above. Nobody in real life comes in those colors. Nobody's eyebrows match their skin color. Yet the character makes perfect sense and doesn't seem wacky. The background also has colors that seem to fight each other. I find this cover incredibly striking, which is a good thing for a book cover to be. By the way, I learned that the hero of this book is named Ellery Queen, a popular detective. Here is another image of Ellery from inside the book. Here he is colored almost the same as before. In this rendition, his gold colored skin has been replaced by a peach color. I like the light blue and dark blue background colors. Here he seems quite pale and his hair turned an orange color. His yellow eyebrows now match his shirt rather than his face. His eyes have become colorless and lost their luster. This coloring of Ellery seems to make him less forceful and more like just an ordinary guy. This peached out drawing of Ellery isn't as refined as the rest. He seems weak and messy. Here is black and white Ellery. 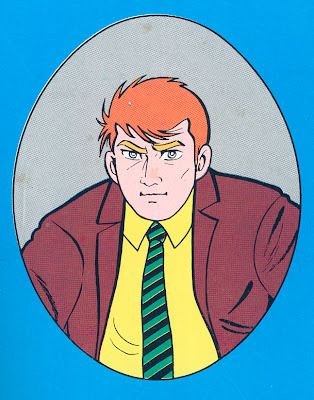 This is how he looks throughout most of the book. Only parts of this book have drawings or short comics. The images serve to add action to the text. 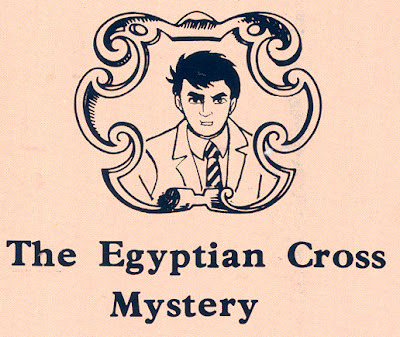 It's a cool format for a mystery novel that I wish was more common. I did some research on this book. It was published in 1993. 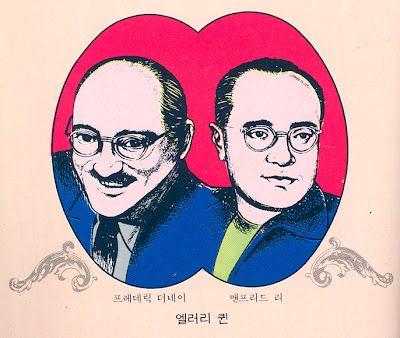 It was written by Ellery Queen, who is actually a fictional author and the story's hero created by these two cousins from Brooklyn, New York. 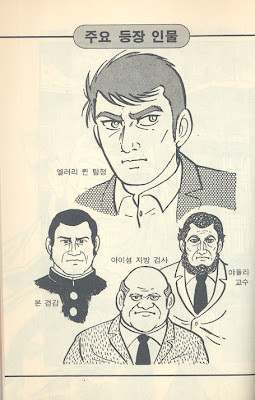 However, I cannot figure out who drew the images for this Korean publication of this story. 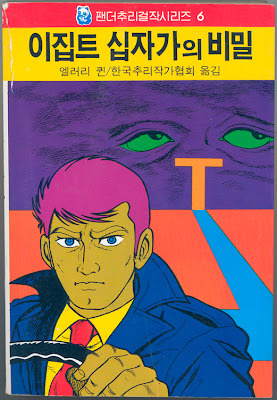 Was it a Korean artist? Japanese artist? U.S. artist? It's a mystery! In any case, the book has stunning colors that make me want to learn more about this character I never knew about before. Do you find the colors exciting like me or are they just too crazy? Have a Merry Christmas, Midodok!